So far we have created a very basic plugin that simply shows our predefined text in articles. You probably have noticed that while we were configuring the plugin there was no other parameters to configure, we have simply enabled the plugin. But many other plugins have many parameters to configure, and how we can have such parameters be added to our plugin? Yes, we are going to learn that now. Let us modify the plugin so that instead of ‘Hello World’ we can show anything we want. We will specify our desired text through a parameter, and that text will be displayed in article. Save helloworld.xml file with the above changes. Then compress the whole directory and install the plugin from Extension Manager screen. We have added a parameter to the plugin and instaleld the new plugin. Now let us go to Extensions > Plugin Manager and click on Hello World plugin. That will show Plugin Manager: Hello World screen. As you see on this screen, we have to select Enabled in Status field. Then on the right hand side you see Basic Options section, under which we see our parameter field with label Alternative Text. Type some text, say ‘Welcome, Friends!’ in this text field. This is the value for our plugin parameter and this will be displayed in artcile. At this point, if you go to the frontend and view any article, you’ll still see old text ‘Hello, World!’. This is because we have not yet modified our plugin file helloworld.php to use the plugin parameter. Let us do this now. // otherwise use "Hello, World!" After these change, copress the whole folder again and install it from Extension Manager. Now go Plug-in Manager and be sure that Hello World plugin is enabled and text is entered. Configuration is done and now you can move to front end to see the result. Click on any article and, voila, you got it! Now you can see the text ‘Welcome, Friends!’ under title of the article. In previous section, we have learned how to add a paramter to a plugin. We simply added the parameter to our plugin without explaining much aboit that. 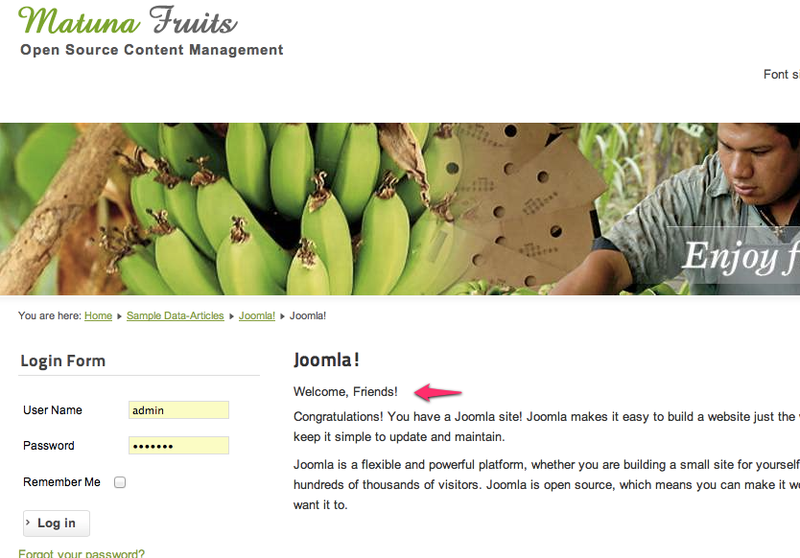 Now let use try to understand how we add plugin parameter fields in Joomla! 2.5.
name : name attribute of a field element is must and it indicates the name of the attriute field. Variables are passed by this name. Later on in php code we need to refer to this name. In our example, we have named our parameter field as mytext. Later in helloworld.php we have used $this->params->get('mytext') to ge the value of this field. type : Another required attribute for a parameter field. This indicates type of field we want. For Joomla! 2.5, there are various types of fields available. In our example, we have used type="text" which means we want a text field. default : This attribute indiates the default value for the field. The value we put in this attribute are displayed by default. In our example code, we have put default="" which means default is null. label : label attribute of a field element is used to indicate label of the parameter field. In our example, we set the field label as Alternative Text. This label controls what the user sees the setting labeled as when configuring. description : This attribue indicates the detailed description of the field that enables users to understand how the field is expected to be filled in. Generally, content of description attribute is displayed as tooltip when mouse is taken over the field label. We have already learned that type attribute is used to set type of the parameter field. For Joomla 2.5 plugins, there are various input types we can use. In our code so far, we have only used the text input type. Now we will explore some other types of plugin parameter fields. description="In which color you want to the message?" As you see, we have added a field named color and its type is set as type="radio". As child of this element options are added. The output of the above will be as shown in the following screen shot. description="What size font should the message use?" To make this a well rounded tutorial, we’ll also include the text input type (even though we referenced it in a previous article). So we use $this->params->get() to get the value of a parameter. Where goes the parameter values? folder : As this is a content plugin, it is in the content folder. enabled : This controls whether or not the plugin is enabled. manifest_cache : This holds much of the information that was found in the plugin’s xml file, such as who wrote the plugin and the author’s contact information. params : Any custom parameters that you create will be stored in the params field. So far we have seen, how to create different types of parameter fields. In our next part of this tutorial, we will look into some more advanced topics. See you then! Thanks for this article regarding adding parameters.